Imagine two hundred thirty years ago in a wilderness land called "Kentucky", two brothers, Francis and William McConnell, made their way along Elkhorn Creek's middle fork called Town Branch Creek. It was there amid the bur oak trees that the McConnell brothers started a settlement. That settlement is known today as Lexington, Kentucky. Two hundred years later, February 2001, harsh winds blew and chilly temperatures prevailed on the unencumbered land on Fayette County's North West side as builders began the first 35 new homes. Those first home buyers, no doubt, possessed a pioneering spirit as well! 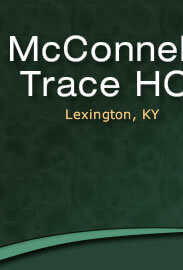 Now McConnell's Trace settlers will enjoy, "a natural space where a community can take root and grow; for the city of Lexington, a potential model for future development---a suburb that is not isolated by traffic-clogged roads, but connected to the city by greenway trails. "* The appeal of a neighborhood surrounded by open, green space, yet still offering a straight shot downtown and a simple crossing of Leestown Rd. to get a child to soccer practice, or to get a pet to the "dog park" is what drew many of us to make McConnell's Trace our home. Developer, Dennis Anderson "planned" to give homeowners a place to retreat to by donating 17 acres of the 230 acre development to the cit for use as a park. Anderson referred to himself as "a developer who consorts with preservationists and conservationists," also left another seven-acre green-way relatively untouched, allowing residents to enjoy a cane break and native bur oak trees. A greenway path will surround the subdivision, with two extensive natural space peninsulas, one extending into the subdivision from the west, the other from the south, providing common areas for children to play and neighbors to socialize. The burr oaks and canebrake will remain undisturbed. Paved trails will connect the entire twenty-four acres of greenspace, affording safe and easy biking and walking within the subdivision and eventually providing non-motorized links to Bracktown, Masterson Station Park, other new residential neighborhoods, and ultimately to downtown via the proposed Town Branch Trail system. *Lexington Herald Leader, Homeseller April 1, 2001 Article by Brenda Kocher.